"I started looking for clinical applications where it would be useful, and that's how I met Esther Freeman, the director of global health dermatology at Massachusetts General Hospital, who has been working to treat the skin cancer Kaposi's sarcoma in Africa for almost a decade," he said. "She had a clinical problem. I had an interesting technology that could potentially help." He did help. He worked with Freeman and Aggrey Semeere, a physician in Uganda, to develop technology that can allow clinicians in rural clinics to diagnose Kaposi's sarcoma using smartphone confocal microscopes, or imaging devices that collect light from a single pinhole to create high-resolution images viewable on a smartphone. The low cost, easy-to-use and portable devices have a potential to make early diagnosis, more effective treatment and lower mortality rates possible. "DK embodies the innovative, can-do spirit of Engineering's new faculty," said Jennifer Barton, professor of biomedical engineering and director of the BIO5 Institute. Barton is a leader in developing cancer-screening endoscopes and mentored Kang for this project. "Not only does he create novel biomedical optics tools, but he puts them to use to help the world's most underserved people," she said. "His new cervical cancer point-of-care detection device will help ensure that no woman dies from this disease, which is eminently curable if caught early." Kang has always enjoyed offering hands-on help to communities in need. He volunteered as a tutor at an orphanage every week during his college years in Korea, and while he was creating the Kaposi's sarcoma microscopy device, he made several trips to the Infectious Disease Institute in Uganda first to see where the devices would be used and, later, to see them in action. While in Uganda, he learned that the country bears one of the highest incidence rates of cervical cancer, at 54.3 per 100,000 women and rising. Mortality rates associated with cervical cancer in East African countries are 27.6 per 100,000 women, a dozen times the United States' 2.3 per 100,000. "This disease is affecting women in their 20s and 30s and 40s—really young women who are just starting their families, who have kids," Kang said. "It's really heartbreaking." Miriam Nakalembe, an OB-GYN in Uganda and Kang's collaborator, said 60 percent of the cervical cancer patients she sees in Ugandan hospitals are already in the late stages of the disease. Without regular pap smears or cervical exams, women simply aren't catching the disease early. Though many local health care providers in Uganda have a cryotherapy tool they can use to freeze off suspect tissue, they don't know when to use the treatment because they don't have adequate screening methods. "A lot of patients have no hospital in their local community where they get this done, so the goal is to bring these low-cost and portable devices to a rural clinic, set up a tent and do the test. Then, right on the spot, they can do the cryotherapy," Kang said. In Uganda and other countries, the most common way to screen for cervical cancer is tissue staining, which has a very high rate of false positives. This means women undergo unnecessary treatments, and limited resources aren't used where they're needed. Another method, confocal microscopy, is more accurate but costs upwards of $50,000. "We want to make the device easy enough to use that anyone with a minimal background in engineering or medical education can use it—the previous smartphone imaging confocal device we were using in Uganda was used by a clinical technician, not a doctor," Kang said. "It's a smartphone. You just turn it on and take a picture." 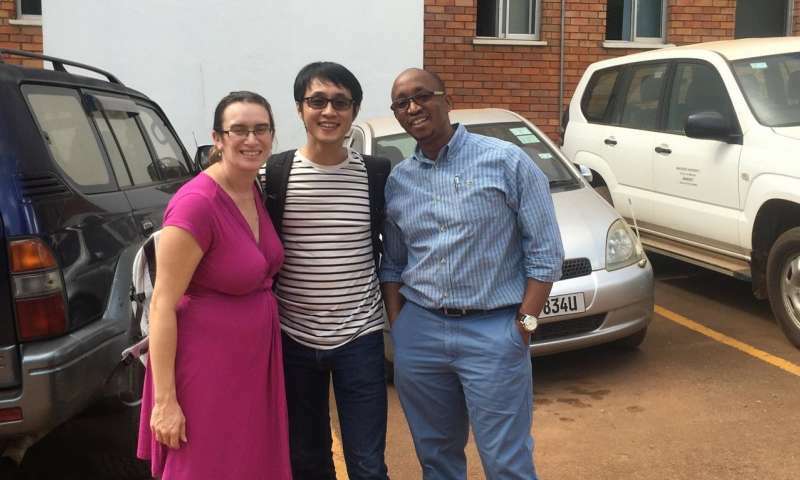 Kang and his Ugandan collaborators hope to begin using the new cervical cancer-screening devices in Uganda in 2019, and are working with Tech Launch Arizona to help commercialize the invention. In the future, the device will be able to identify potentially cancerous areas, analyze images automatically, and recommend the appropriate treatment. The device should mean patients don't have to travel far to clinics, but even if they do, they could undergo a few minutes' screening and be treated the same day if cancer or precancer is detected. "Sometimes, I think I just might want to take more than one shower every day," he smiled.